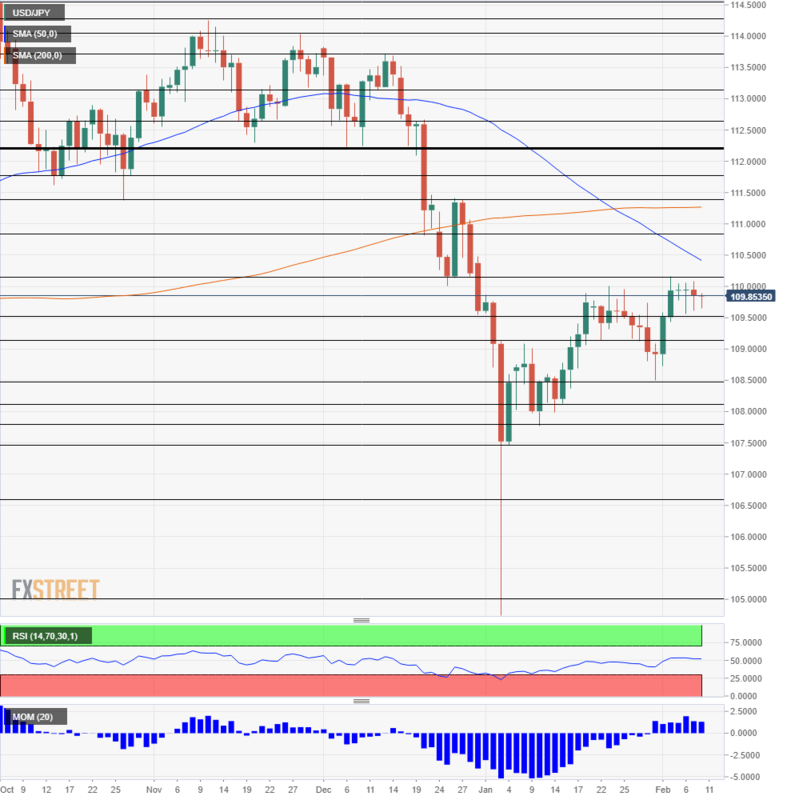 USD/JPY stuck to a narrow range amid weak data but an optimistic Powell. 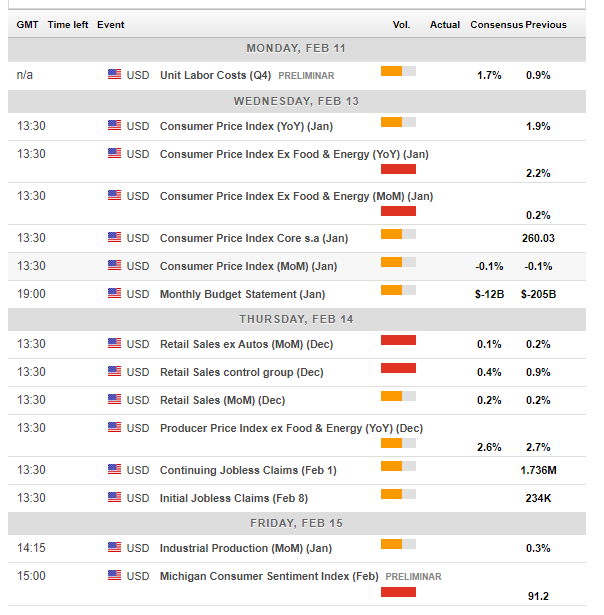 US retail sales, consumer confidence, and inflation stand out. The technical picture is balanced for the pair. US data mostly missed expectations. The ISM Non-Manufacturing PMI dropped to 56.7 points, below expectations and going against the move seen in the manufacturing sector. Nevertheless, the figure reflects solid growth. Jobless claims stood at 234K, below the previous week but still above the averages. President Donald Trump delivered his State of the Union address and did not offer any earth-shattering news on economic programs. He was happy with the state of the US economy and optimistic about a trade deal with China. He did confirm a second summit with North Korean leader Kim Jong-un at the end of the month. Trump will not meet Chinese President Xi Jinping ahead of the US imposed the deadline to conclude trade talks in early March. The news weighed on the mood. The US intends to hit China with new tariffs if the negotiations do not result in a deal. More importantly, Fed Chair Jerome Powell, whom Trump met early in the week, was upbeat on the economy. He said it is "in a good place." While the pause on rate hikes remains intact, the upbeat tone helped the US Dollar despite uninspiring data. Japanese data came in line with expectations and left the scene to global developments. And while China celebrated the New Year, a flow of downgrades came from the UK and Europe. Lower economic growth was partially blamed on China and in Britain's case, on Brexit as well. The growing narrative of a global slowdown supported the safe-haven yen. All in all, the picture remained balanced for the pair. Several figures are of interest early in the week, but things warm up in earnest only on Wednesday with the inflation report. Headline, Consumer Price Index, slowed down to an annual pace of 1.9% in December amid falling energy prices. However, Core CPI remained stable at 2.2% with a monthly increase of 0.2%. The Federal Reserve is not very concerned about inflation which has been stable. A drop in Core CPI will allow the Fed to practice "patience" for longer and refrain from raising rates. An uptick may bring back speculation of a rate increase this year. Thursday features another significant release: retail sales. Headline sales rose by 0.2% in December, and so did core sales. However, the all-important control group jumped by 0.9% and was undoubtedly encouraging. More moderate gains are likely in January. The US economy is all about consumption, and the publication is set to rock markets. The Producer Price Index will provide additional insights into price development in the release on Thursday. Weekly unemployment claims will also be watched due to the recent uptick. Last but not least, the University of Michigan's preliminary Consumer Sentiment Index for February will shed some light on the current state of the consumer. After many stable months, it dropped to 91.2 points in January. The US government will shut down on February 15th if there is no new agreement between Trump and the Democrats. The President insists on funding for the border wall which Democrats oppose and Republicans are reluctant to approve. Without a deal, the economy will suffer additional damage after the record 35-day closure. The Japanese economic calendar does not often feature significant events, but this week is different. The Land of the Rising Sun published the preliminary GDP report for the fourth quarter of 2018. The economy contracted by 0.6% in Q3 and another decrease in output will place Japan in a recession. However, the economy is likely to have grown in Q4. Industrial output is also of interest later in the week, but a more significant impact, as usual, will be reserved to stock markets. The relatively calm mood in markets is reflected in a lack of significant movements in the yen. The safe-haven yen is in demand in times of trouble. Also, watch out for news regarding North Korea ahead of the second Kim-Trump Summit later in the month. Preparations are in place, but so far, negotiations about the rogue nation's nuclear program have gone nowhere. Dollar/yen has stabilized at higher ground. While momentum has turned positive, the Relative Strength Index remains stable. The pair trades below the 50-day and 200-day Simple Moving Averages. All in all, the picture is mixed after the recent limited range trading. Resistance awaits at the recent highs of 110.15, which are also the highest in 2019. Next up, we find 110.85 that was a temporary support line in mid-December. 111.40 was a resistance line around Christmas and retains its role. 111.75 worked in both directions in the autumn. 112.20 was a double bottom in November and switches to resistance. Immediate support awaits at 109.50 that cushioned USD/JPY in recent days. 109.15 is the next line to watch. It provided some support in late January. 108.50 was a swing low in early February and is a significant support line. 108.10 and 107.75 were stepping stones on the way up in January and 107.50 was the level that USD/JPY stabilized at after the flash crash. US data may continue disappointing, and this time, dollar/yen may catch up with the data. There is more room for falls than rises on the pair. 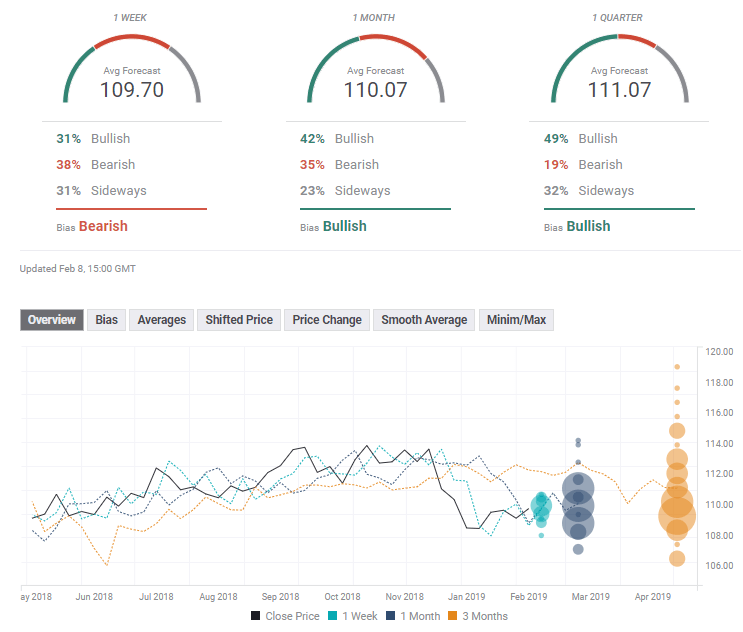 The FXStreet forex poll of experts shows a bearish trend in the short term and bullish one afterward. Forecasts have been slightly upgraded in the past week, but targets have not changed much.